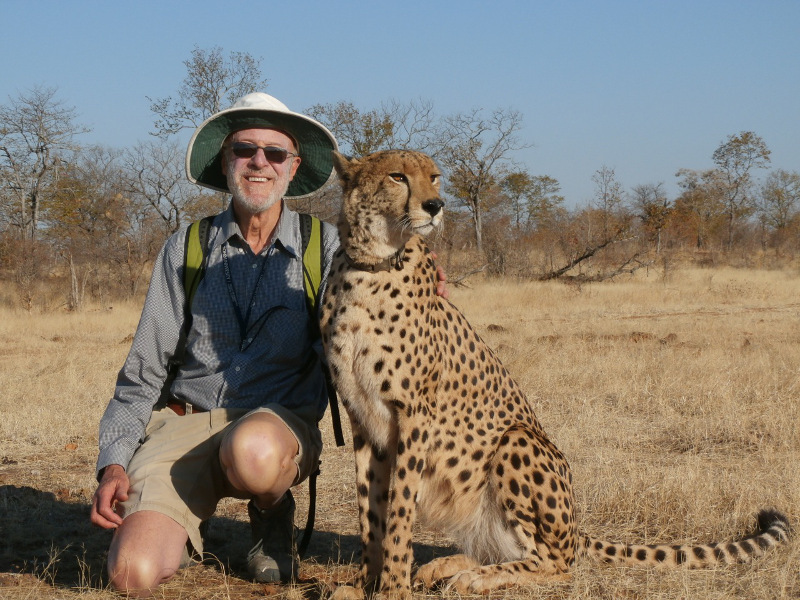 You go on safari in Africa to see the animals, to hike up one of those famous red sand dunes and perhaps take a walk with a cheetah. But can you imagine having an equally memorable experience by doing something ordinary? Like going to a local church on Sunday, whether or not you are religious? And what happens when something goes wrong, like a major or minor medical situation, loss of something important or a mid-trip itinerary cancellation? My friend and I experienced all these situations on a recent African safari to Namibia, Botswana and Zimbabwe: the scenery, the animals, the church service, a chipped front tooth and eyeglass lens, the loss of a camera charger and finally, the cancellation of our visit to Mozambique. But our story had a happy ending, as all well-planned and memorable trips should! In Namibia, we met a white dancing spider after our guide Simon lifted the tiny silk lid from its hole in the ground. 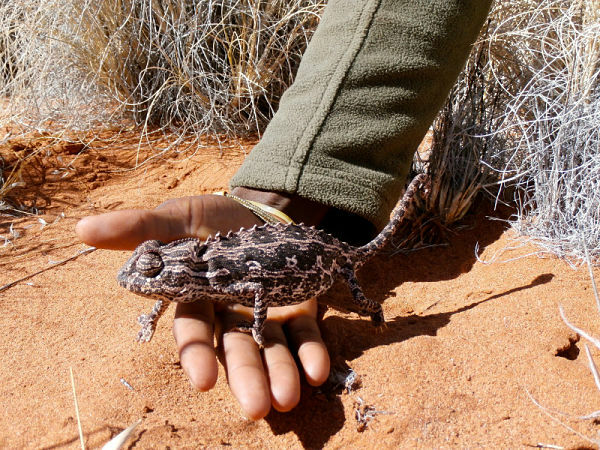 I also met a chameleon that moved slowly along my arm, its eyes rotating every few seconds. 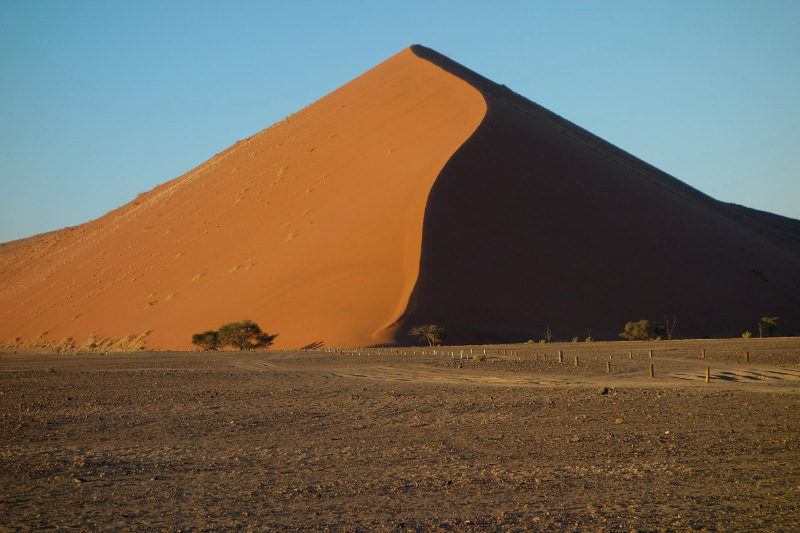 At the Little Kulala Camp in the Namib Desert, we climbed along the knife-edge of a beautifully curved red sand dune, its sharply-defined ridge, a meeting place of sunlight and shadow. 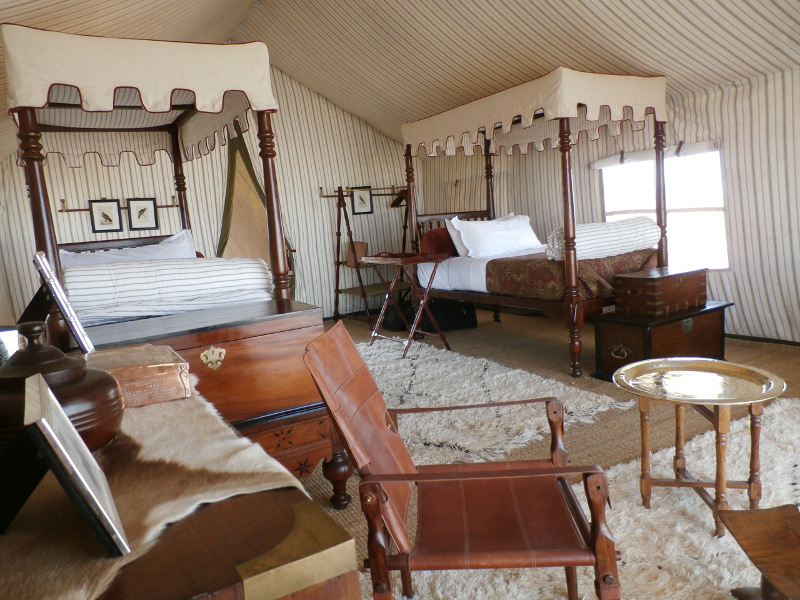 On this once-in-a-lifetime African safari, we had chosen top-end camps. We felt it was worth the money not only to stay in luxury tents and other safari accommodation, but also to have the personalized experiences such small camps provide. 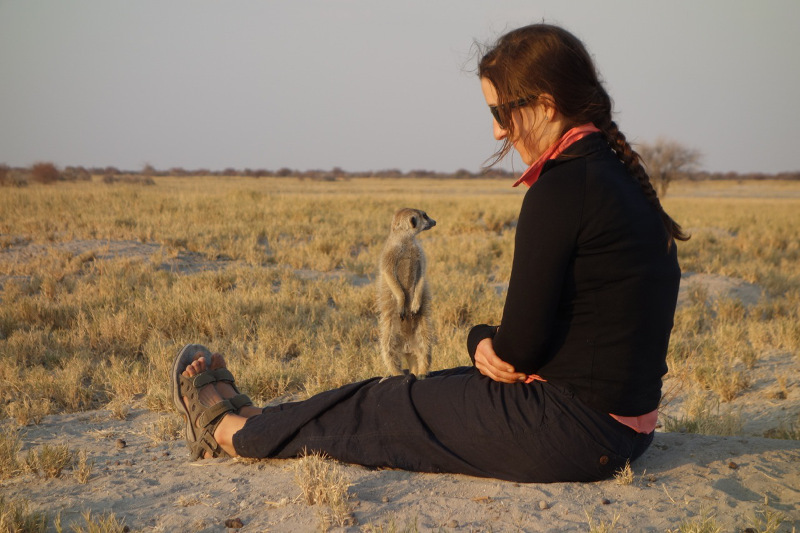 A short drive from San Camp, on the edge of Botswana’s stark white Makgadikgadi Salt Pans in the Kalahari Desert, we sat on a dirt mound near the meerkat burrows. If you’re lucky, a meerkat might climb onto your lap (or even your head) to gain some height for its classic lookout pose. 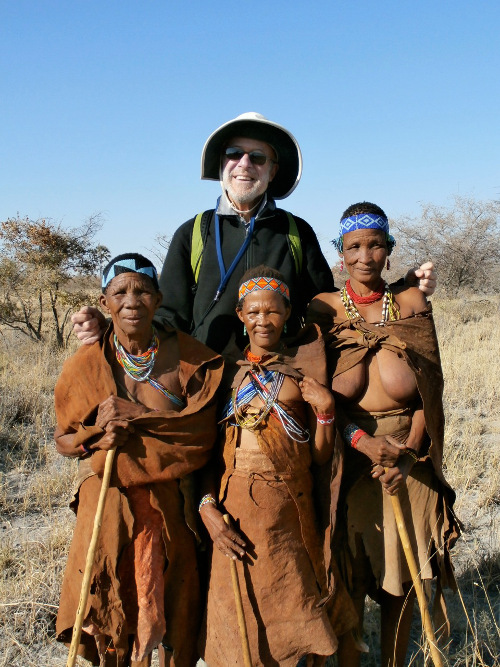 The next morning we met a group of bushmen staying temporaily in the area. They chattered away happily in their click language, squatting every so often to examine a track on the ground or to identify what looked like a random twig, (but turned out to be a food source clue). 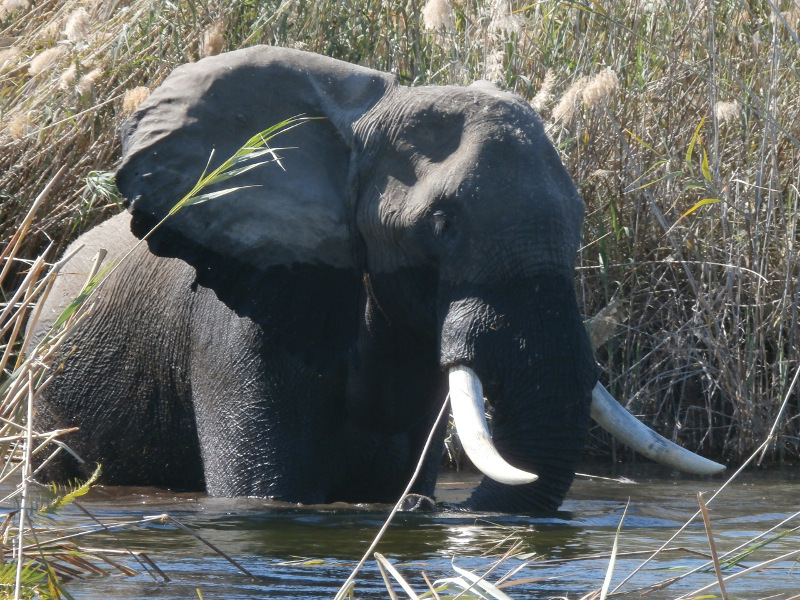 At Vumbura Camp in Botswana’s Okavango Delta, it was back to the animals—and instructions on what to do if we unexpectedly met an elephant. Roger Carloni, our private concession manager, smiled as he went through the new guest initiation, but you could tell he wasn’t joking. This was the Africa we came to see, where elephants, lions, giraffes, hippos, warthogs, wild/painted dogs, kudu, zebra and baboons (to name just a few), roam free. It’s 6 AM and an hour later we’re with Ban, our Vumbura guide, on our morning game drive. He stops to examine animal tracks in the dirt, then unexpectedly swings the steering wheel and heads off through the low scrub. A few minutes later, he pulls up by a tree and there they are, perhaps three metres away: eight lions in the grass, warming up in the rising sun after a night’s hunt. Normally you never get out of your vehicle when you see the animals. But just south of the Zimbabwe side of Victoria Falls, at Elephant Camp, we walked with Sylvester, a three-year-old cheetah raised as an orphan. It was like walking with a large dog, or petting a cat—a very large cat. If you are lucky, you get a lick on the leg with a sandpapery tongue, perhaps even a lick on the face or a love bite… and for a brief second, as you feel those large teeth, you wonder if you will get your hand back intact. 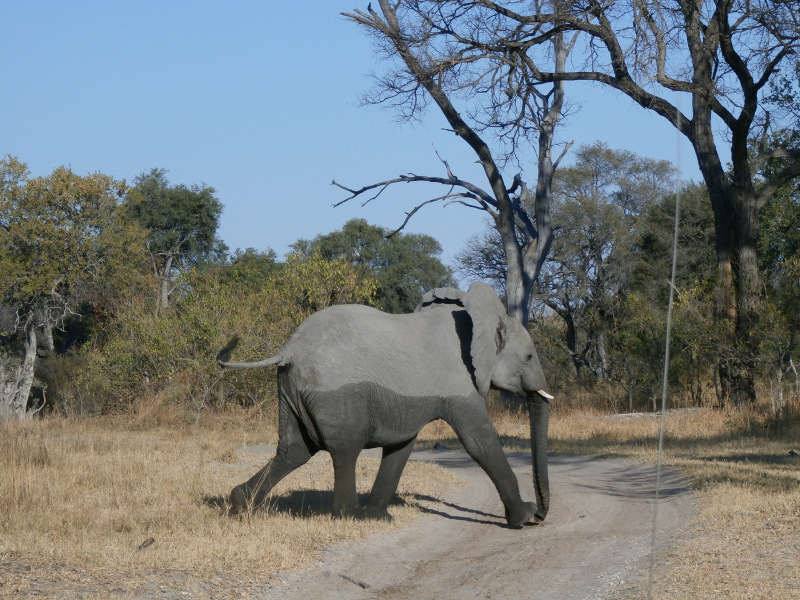 Further south, at Somalisa Camp in Hwange National Park, we walked out of our tent—and looked directly into the eyes of a startled elephant, barely a metre away. She decided to scratch herself against one of the tent’s supporting poles, vigorously shaking the whole side of the tent. Was this the moment we were supposed to blow the air horn to summon help? Well, no. This was just one of those “up close and personal” moments we’d come to expect in a place like this—like having elephants drink from the camp’s plunge pool with the guests barely two metres away. 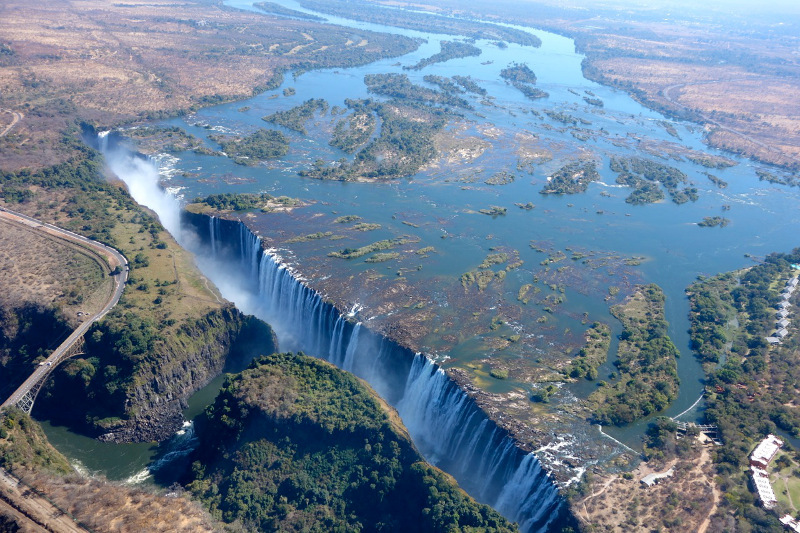 But Africa offers far more than scenery and animals. It was Sunday and we had asked to attend a local church service to meet the locals. We arrived at the Catholic church in the village of Dete at 8 AM for a four-hour service like none we had seen or heard before. The simple brick building was almost filled to capacity as a procession escorted the priest inside. The singing, swaying and dancing were accompanied by drums and maracas keeping the beat. Punctuated by shrill ululations, they transformed this service into a colourful, lively, harmonious, and deeply moving experience. For our part, our hearts hardly skipped a beat when we ran into the medical-dental problems, loss of the camera charger and Mozambique cancellation. “As long as the travellers have done their preparation properly – taken out travel insurance, filled out the pre-departure health form – then the travel agent and camps should be able to react immediately,” said Monika Korn, our travel agent. Notified of the chipped tooth and eyeglass lens when we were staying at Little Kulala, Korn contacted fellow travel agent Ernst Wallner in Windhoek, Namibia’s capital, where we had a brief stopover the next day. By the time Wallner met us at the airport, he had already made appointments for us to see a dentist and optometrist. “It’s so important to deal with an agent who has on-the-ground experience, resources and local contacts,” Korn said. At Vumbura Plains, when the camera charger was discovered missing, concession manager Carloni arranged for a replacement to be flown out on the next day’s bush plane—without any cost to us. Otherwise, depending on our travel insurance coverage, we could have applied for reimbursement of the replacement. Our travel agent’s words about travel insurance resonated when the Mozambique government unexpectedly closed Gorongosa National Park, just before we were due to fly there. We ended up visiting the Cape Town area instead, and were reimbursed through our insurance for the unrecovered cancelled trip costs. We felt we had passed the true test of a well-planned trip. Overall, we felt we had achieved the full African experience—enjoying the scenery and interacting not only with magnificent animals, but also with the people. 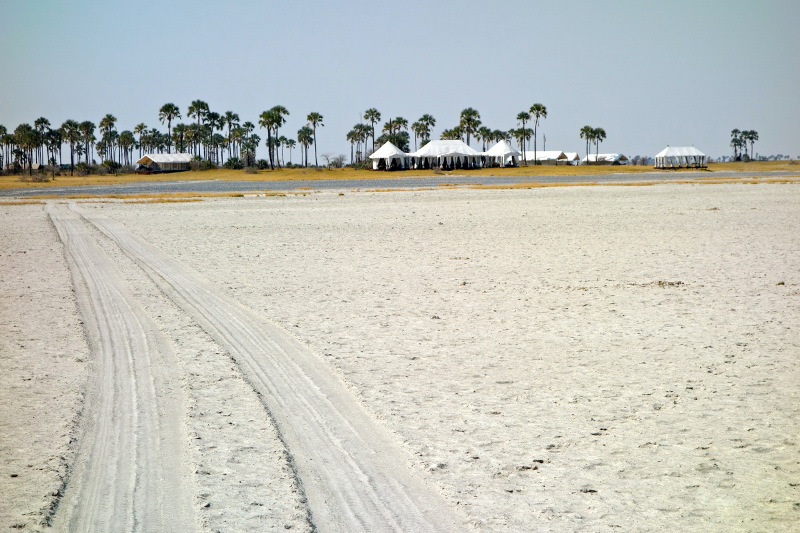 Satisfy your curiosity for Africa and read about Iain’s adventure in Molepole, Botswana. If you’re a budget-savvy traveller, you should know that Canadian healthcare barely covers us if we’re travelling out of the country. Take Canada with You on your next trip abroad with TuGo’s travel insurance. Upload a photo of yourself travelling and get a chance to win 1 of 8 Amazon gift cards or your dream vacation!